ESA's SMART-1 captured its first close-range images of the Moon this January, during a sequence of test lunar observations from an altitude between 1000 and 5000 kilometres above the lunar surface. SMART-1 entered its first orbit around the Moon on 15 November 2004. It has spent the two months following spiralling down to the Moon and testing its array of instruments. The first four days after being captured by the lunar gravity were very critical. There had been the risk, being in an 'unstable' trajectory, of escaping the Moon's orbit or crashing onto the surface. Because of this, the electric propulsion system (or 'ion engine') started a thrust to stabilise the capture. 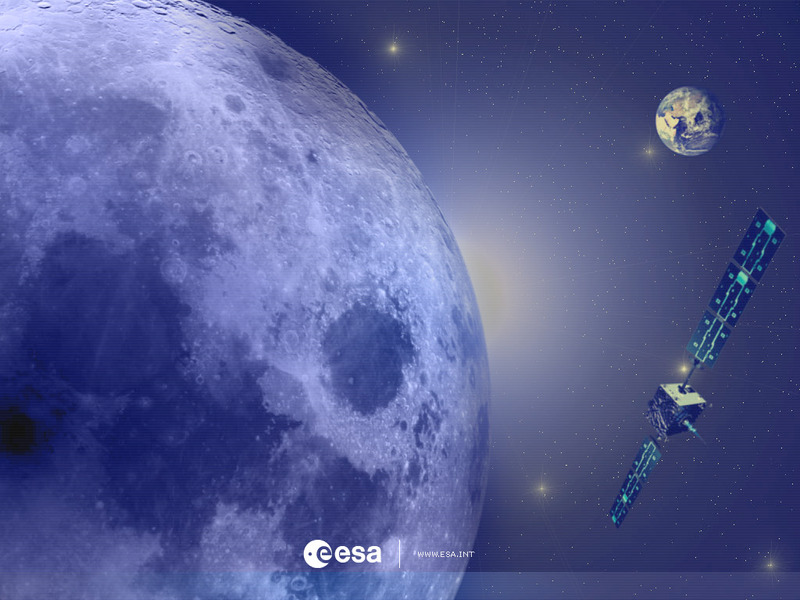 The ion engine was switched on until 29 December, allowing SMART-1 to make ever-decreasing loops around the Moon. The engine was switched off between 29 December and 3 January 2005 to allow scientists to start observations. At this point, the AMIE camera took the close-up lunar images. The engine was switched off again to optimise fuel consumption on 12 January, and SMART-1 will spend until 9 February making a medium resolution survey of the Moon, taking advantage of the favourable illumination conditions. ESA's SMART-1 Project Scientist Bernard Foing said, "A sequence of test lunar observations was done in January at distances between 1000 and 5000 kilometres altitude, when the electric propulsion was paused. We are conducting more survey test observations until the electric propulsion resumes from 9 February to spiral down further towards the Moon. SMART-1 will arrive on 28 February at the initial orbit with altitudes between 300 and 3000 kilometres to perform the first phase of nominal science observations for five months." The first close-up image shows an area at lunar latitude 75° North with impact craters of different sizes. The largest crater shown here, in the middle left of the image, is Brianchon. The second largest, at the bottom of the image, is called Pascal. At low illumination angles, the crater shadows allow scientists to derive the height of crater rims. "This image was the first proof that the AMIE camera is still working well in lunar orbit," says AMIE Principal Investigator Jean-Luc Josset of Space-X. The composite images shown here were created to show larger-scale features. The first mosaic shows the complex impact crater Pythagoras and the strip of images (bottom) was produced from images taken consecutively along one orbit. Starting with this mosaic, SMART-1 scientists expect to build up a global medium-resolution context map, where high-resolution images later observed from lower altitude can be integrated.